This was the first subject I found after starting along the coastal trail in Cahuita National Park. There were dozens of these little moths on some sort of plant that was prevalent along the coastal trail. When I spotted the first one, I thought perhaps it was a leafhopper. It was only after seeing one up close that I realized it was a moth, and a spectacularly colored one at that. I’m amazed at how well the forewing and hindwing patterns line up. While clearly two wings toward the tail end, you can barely make out the division between them elsewhere. As for what purpose this pattern serves, I’m stumped. They stand out well on the foliage, so it’s hard to imagine it provides camouflage. Perhaps these are warning colors, but why then the intricate pattern towards the rear? It might be a false eye sort of thing to distract attention away from the important end. And the two red bands do look kind of like legs, if the thing were facing the opposite direction. As I wrote that last paragraph, I recalled photographing a leafhopper with a similar pattern later in the trip. It also had bands of black and yellow. Maybe there’s some sort of mimicry situation going on here. This was also my first opportunity to field test a new flash diffuser I put together before traveling. I used it extensively throughout the trip, and it worked out well. It’s kind of a flash battery killer though. I generally had to replace my flash batteries halfway through the day. Awesome! 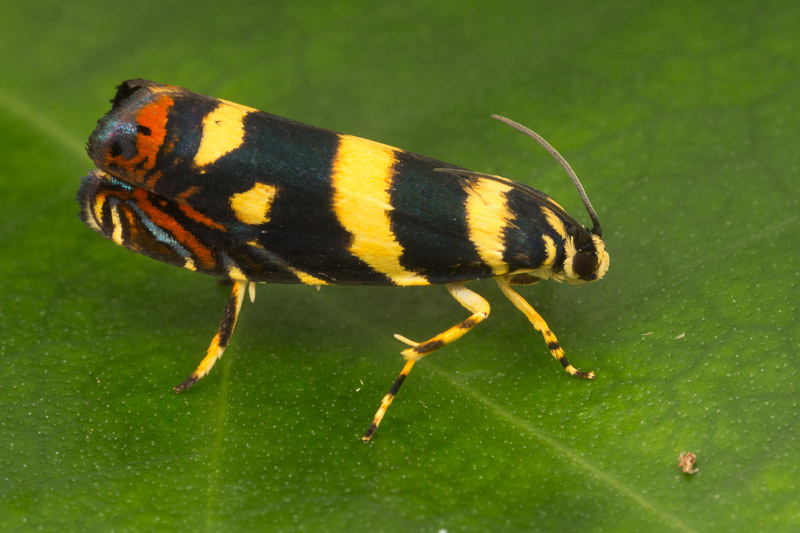 Interesting you should mention the similarly patterned leafhoppers, because my first thought when seeing the thumbnail shot at FB was “leafhopper” (with the “head” being at the tail end). Could be a mimicry association, although there’s a greater chance of the moth being the model than the leafhopper.